Thursday nights are a general "out" night for us, as I've apparently only just figured out, but maybe you guys have seen this pattern for a while now. Jim and Viv joined us for all-you-can-eat sushi at Sushi 85. For $25, you don't get a buffet, you get a laminated list of rolls and nigiri, and just mark off what you want! Each person can order three items at a time, so you get a great variety pretty fast. I wasn't in the mood for a lot of nigiri (same with the rest of the table), so I ordered a couple pieces of ebi (cooked, split shrimp) and a couple unagi (eel) and called it a day. Ebi was average and unagi was a little dry, which doesn't jive well, since it's already served with sauce. JB got two orders of sake (raw salmon), as he really likes their salmon. I wasn't as big a fan, but it could be my pieces (toppers to rolls, will mention soon) were more stringy than his. 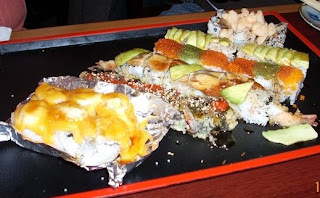 There were several rolls on the table I didn't try, since they had crab in them (like the California. the Green Dragon. the Rainbow). But they were generally gobbled up, so I'm guessing there were no complaints! The worst roll goes to the New York Roll, which was (cooked) shrimp and cucumber. Cucumber was too overwhelming when there weren't a lot of flavors present. Of course we ordered a Philly Roll (salmon and cream cheese), and it was good, although a lil heavy on the cream cheese. JB insisted on a Lion King Roll, which was immense. Easily the largest I've ever seen (even bigger than the Beauty & the Beast at Siam Orchid, which previously held this record in my eyes). It was a crab and avocado roll with baked salmon and a special sauce on top. I ate a few pieces of the top salmon, and it was really different (in a good way). [the photo to the right is a stock photo I found online, but in the left corner you can see the craziness that is the Lion King Roll] Then there was the Tai Ji Roll, which was eel and cucumber with white tuna on top. That was a slight letdown, probably because I treasure a tasty eel, and theirs isn't top-notch. We had an overpowering choice... the Ocean Roll... it had too much in it... tuna, salmon, albacore, spicy tuna, and cucumber. The final roll of the night was the Popcorn Shrimp, and it was great!! It wasn't the crumbly popcorn shrimp like you'd get at KFC, it was more like a sweet-and-sour-type fried shrimp. It and a yummy sauce topped a roll that had shrimp and cucumber in it. Comparing it to our other all-you-can-eat sushi experience out here (at Todai), it was good. The variety was a lot greater, but there were no sashimi options and the nigiri wasn't too impressive.